Patchy Work of Mini Grey: Disappearing 9 Patch Table Runner Tutorial. Disappearing 9 Patch Table Runner Tutorial. This is such an easy runner to make. I'll do a tutorial here to show you just how easy lemon squeezy it is! I made this one with 27 charm squares, these ones are 5 inch squares. So lay them out into 3 groups to form a 9 patch block. Keep in mind that the squares in the corner of a 9 patch block will not be cut, so make sure that is a print you really like. The square in the middle of each 9 patch will be sliced twice, so keep that in mind too, busy prints or a neutral work best for the center square. 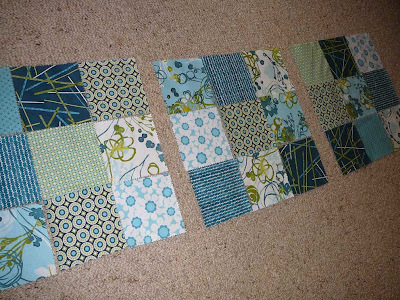 So once you are happy with the placement, sew them into 9 patch blocks. Hopefully they will stay in order! I always seem to get one row mixed up along the way. And this is the fun part! After ironing your 9 patch block, slice it in half, rotate it and slice it again. So your block now becomes 4 blocks. After you have cut all 3 of the original 9 patch blocks together, you now need to arrange the 12 new blocks in a pleasing manner. 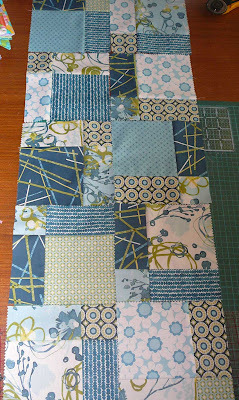 For this one I regrouped 4 little blocks to make one big block again, so I had 3 large blocks to make the runner. I tried to have 2 little squares in the center of each block facing the same way for each of the 3 larger blocks. Does that make sense? But you could really arrange the blocks anyway you wished. That's the joy of a Disappearing 9 Patch block, it doesn't really matter! So once you have sewn all those blocks together you are on the home stretch! To make this runner just a little bit bigger and to frame it, I added a border of 1.5 inches as above. Quilt as desired. I just did a meandering stipple all over the D9P blocks and an echo stitch just inside the border. Binding is on and pinned in place ready to hand sew down for this one. See? Easy! Let me know if you make one, love to see. Ahhh, that brings back memories of our D9P swap a couple of years ago! Such fun! Well, you know I won't be making one. But the blue is beautiful. Which lucky teacher is getting that one? 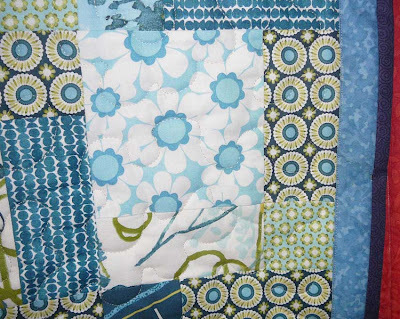 Love this fabric Helen!! I have lots of it myself...no sure what to do with it yet! gorgeous! 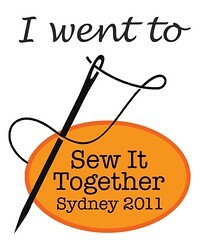 ok I can do that, once my market is over I'm making one! thanks for sharing, that is just the kind of tutorial I need with lots of piccies! Great table runner and tutorial. I love iot when bloggers show how they made something. Sorry the link didn't work. I blogged about the runner in October. Thank You!! I am wanting to make one now!! 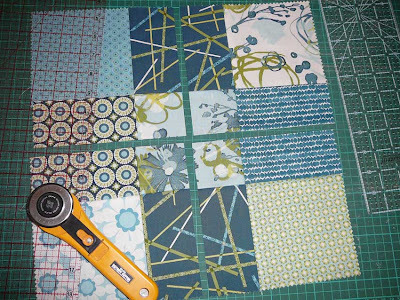 Thanks for this tutorial, I've just used it to make my first quilt! magnifica idea!I love "random look"